Stone shovels with 50-100 damage can be found in 21.8% of loot chests in stacks of 1. Two shovels of the same material can be combined in the crafting grid to combine their durability. This can also be done through use of the anvil, to preserve enchantments. Shovels can be enchanted directly through the enchantment table. Item data is used to determine the durability of the shovel. If using the /give command, this can be specified using the third parameter. Positive integers are how much durability the shovel has taken away from full durability, and negative integers are how much durability the shovel has left. 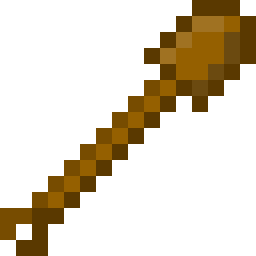 For example, the command /give wooden_shovel 1 10 gives one wooden shovel with ten durability taken away from full durability. This page was last edited on 22 February 2019, at 06:45.